Thai rescue divers and a tourist police boat conduct a search mission for missing passengers from a capsized tourist boat off Phuket, Thailand, on Saturday. 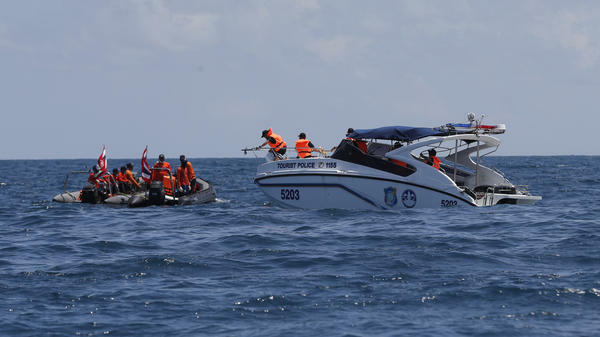 Rescuers have recovered 41 bodies from the ocean after the boat carrying more than 100 passengers, most of whom were Chinese tourists, capsized in rough seas on Thursday, according to authorities. Phuket Gov. Norraphat Plodthong said 51 people had been rescued from the boat, called the Phoenix, which sank after it was hit by 16-foot waves, the Associated Press reports. Divers who joined search and rescue efforts described disturbing scenes from inside the boat wreck of children's bodies entangled in the arms of their mothers, according to the AP. "It's very difficult to see ... it's traumatic, it's tragic but the best thing to do, our job as divers, is to bring back the bodies to their families," diver Philip Entremont told reporters on Saturday. Rear Adm. Charoenpol Kumrasri, a deputy commander of the Thai navy who is leading the rescue effort, said his hopes that more survivors will be found were diminishing. He said he expects the divers will complete their search of the ship wreck by Saturday night. "After this evening, if we do not find any more missing in the wreckage, the missing will float to the surface and we will be able to find them," he told reporters. Meanwhile, Chinese authorities are appealing for 40 more freezers after the Phuket provincial government announced that the island's hospital morgue had reached capacity. A Thai Health Ministry official told Reuters that about 20 have been donated so far. China's Ministry of Culture and Tourism is also urging Thai tourism agencies to more explicitly outline the dangers of travel during the country's rainy season, which occurs from May to mid-October and is often characterized by strong winds and scattered storms along the coasts, Reuters reports. The Phoenix was not the only boat to encounter mayhem during Thursday's storms. The Phuket News reported all 39 people on board another vessel that sank were rescued, and two Russians involved in a water scooter accident were reported safe. The Phoenix sinking is the one of the worst recent disasters in Thailand, which relies on tourism as a main driver of the economy. The accident comes as Thailand is already embroiled in an effort to rescue 12 boys and their soccer coach who are trapped inside a flooded cave.